As a crocheter, it's great when there's a new baby coming into the family and the parents automatically assume you are going to be making things. This is such a huge compliment to be counted on and to know your work and time is valued. I was especially tickled to learn that my daughter and her husband had chosen to decorate the nursery for their second child with character from Hayao Miyazaki movies. Though I am nowhere near as big a Ghibli fan as they are, I definitely count Spirited Away and Howl's Moving Castle among my all-time favorite movies. And I had such a great time helping decorate the Wizard of Oz nursery from my first grandbaby I knew this was going to be a blast! I worked in secret for the most part. My daughter knew I was making a mobile and I had shown her the Ponyo that I finished first. The rest I said absolutely nothing about and just showed up with them on the day of the baby party (Not really a shower since they already had all the baby stuff they needed, but a celebration for family and friends anyway!). Needless to say the big box of decorations I unveiled were a huge surprise, though they were not entirely shocked that I had gone way overboard. I was most proud of the mobile that I had put such a lot of thought into. My first idea with the mobile was little Soot Sprites, stars, and a long vine. I thought I would just hang them from some embroidery hoops like the last time and that would work great. Then I had this amazing idea that I might could find a small umbrella- because Totoro often carries an umbrella. And I did! On Ebay I found a generic working doll umbrella just the right size! And it was only $5! I was so very tickled! Unfortunately, they didn't send the right color but time was running out to get the project completed. I had ordered an aqua blue and got royal blue, but I don't hate it. So when the umbrella gets here I realize that the vine thing doesn't really work and I am going to need more little things to hang. I didn't want more black, so not more easy pompom Soot Sprites. And the stars, a great pattern from Crochet Dynamite, were super fast to crochet but I didn't much want to do a lot more of hand-sewing they required. I had the idea of the rain drops, but had to look on Google and Pinterest for more ideas. In the end I decided on mushrooms and 2 things that went with the rain- a small umbrella and a cloud. I really love how it came together and especially that it's a little off-balance because the cloud + Sprites are heavier than the smaller parts. It makes it slightly more whimsical, if that is possible. Here are the patterns for the pieces I used. Many thanks to these and all designers that share their patterns for free. This is especially helpful when you are just trying things out and not sure if you will go with it or not! Soot Sprites - These are just small PomPoms made on a 1.75inch pompom maker. The eyes are felt with yarn pupils and the yarn is Caron Simply Soft. Stars - From Crochet Dynamite - Mini Wishing Stars. These I made with Bernat Cotton-ish and a D-hook, but you can use any yarn and hook combo to achieve the size you want. The Vine, which ended up as decoration in the nursery, but just not on the mobile, is from a pattern Leaf Garland by Little Conkers. It is a seriously fast and easy project. I made a vine about 12 ft long in under an hour. It is made with I Love This Yarn and a G6-hook. Again, the hook and yarn is up to you. The Raindrops I just free-handed- and they are not all the same size. They were inspired by this pattern by Lucia Forthman. Her raindrops were a little too big for the yarn I wanted to use and the page didn't translate well for me, but I definitely learned the basic shape from the line counts of her pattern, so much thanks. Caron Simply Soft and a D-hook. The Cloud is from Maggie Vassie. I Love This Yarn and a D-hook to get the size down a tad. It turned out just perfect. And last, but not least, the Umbrella is from a pattern by Kim Lapsley. I sized it down just a tad by leaving out a few rounds and altering the edging to fit the stitch count. The handle I made with jewelry wire which I wrapped in the same Red Heart baby from the mushroom. And the Small Blue Totoro centerpiece is from a pattern by Lucy Ravencraw. I used another of her patterns that I will show off in another post. I Love This Yarn and an F-hook. 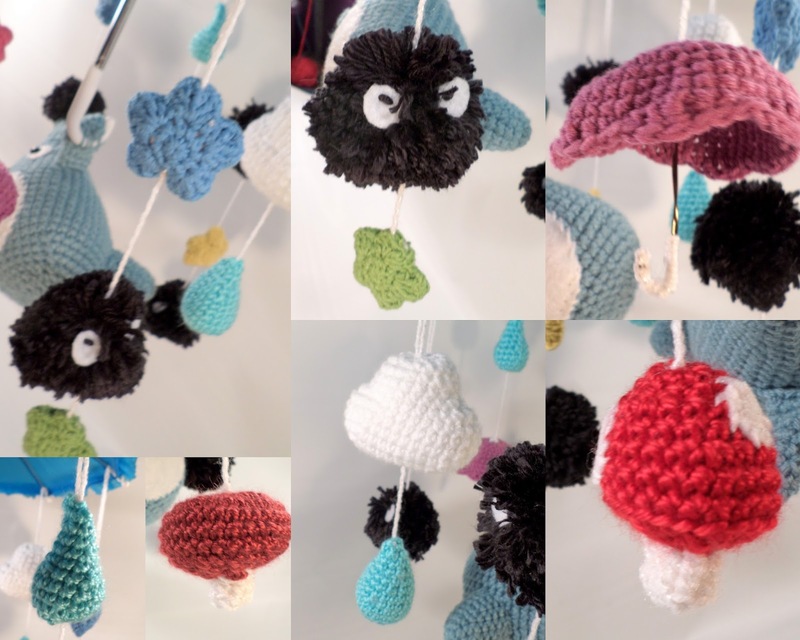 Incidentally, I made larger Soot Sprites with the larger PomPom makers- and an even larger one that is actually crocheted in the most time-consuming way EVER. These I used Googly Eye Buttons that I found at Hobby Lobby. I love them, but they were too large for the Mobile. And to be frank, making a lot of really large PomPoms was kind of driving me insane. They have been added to the rest of the nursery decor, though.